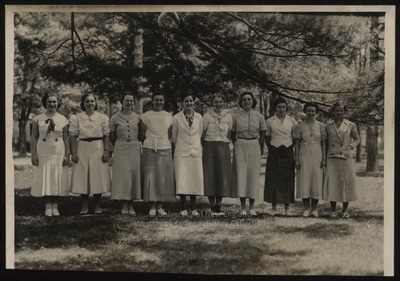 "Westbrook Junior College, Class of 1934"
Ten girls from the Class of 1934, Westbrook Junior College, Portland, Maine, stand shoulder to shoulder on the Green and in front of a large pine tree in this sepia toned senior class photograph. They wear spring/summer dresses or suits and light-colored shoes. Their hair is either pulled back of their ears or softly curled over their ears.Most smile and all look straight into the camera.